Our self-catering cottages are located in the grounds of Wringford Down, an old Cornish Manor house in which the owners live. Children welcome from any age. 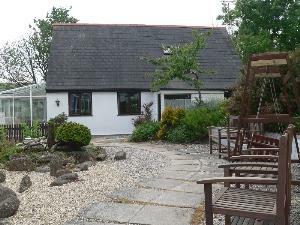 Wringford Cottages sometimes limits bookings to 7 or more days. Bedroom has king size bed. Bathroom has bath with shower over. Open plan lounge/kitchen/dining room. Kitchen has cooker, microwave & fridge/freezer. Maximum occupancy 2 (room for travel cot). All heating & lighting costs included. Linen & towels included (except towels for pool/beach). 1. Forder sometimes limits bookings to 7 or more days. Bedroom has king size & bunks. Bathroom has bath with shower over. Open plan lounge/kitchen/dining room. Kitchen has cooker, microwave & fridge/freezer. Maximum occupancy 4 (room for travel cot). All heating & lighting costs included. Linen & towels included (except towels for pool/beach). 2. Freathy sometimes limits bookings to 7 or more days. 3 bedrooms - double, single, & bunks (2'6") - note from bedroom 2 have to pass through bedroom 3 to get to bathroom. Large bathroom with bath with power shower over. Kitchen/dining room with cooker, microwave, dishwasher, fridge/freezer. Large lounge with views across the valley to Rame church. Maximum occupancy 5 of which at least 2 should be children (child size bunks). Room for travel or put-u-up. All heating & lighting costs included. Linen & towels included (except towels for pool/beach). 3. Maker sometimes limits bookings to 7 or more days. 3 bedrooms - two doubles & a twin. Bathroom with bath with power shower over. Large open plan lounge/kitchen/dining room. Kitchen has cooker, microwave, dishwasher & fridge/freeezer. Patio with views across the valley to Rame church. Small private garden. Normal occupancy 6 adults/children. Put-u-up &/or cot available for extra child. Extra people charged at £10 per night. 4. Cottage sometimes limits bookings to 7 or more days. Take the A374 car ferry (free) from Plymouth to Torpoint. At Antony turn left towards Millbrook, then left onto B3247. Just past Millrook turn right for Cawsand then immediately right again. Wringford is on the right just over the brow of the hill. Stayed at Wringford Cottages for a Wedding at Polhawn Fort. Location was brilliant for the Wedding but very remote for days out with a young child. Cottage was clean and very spacious but does need some TLC to bring it up to date.